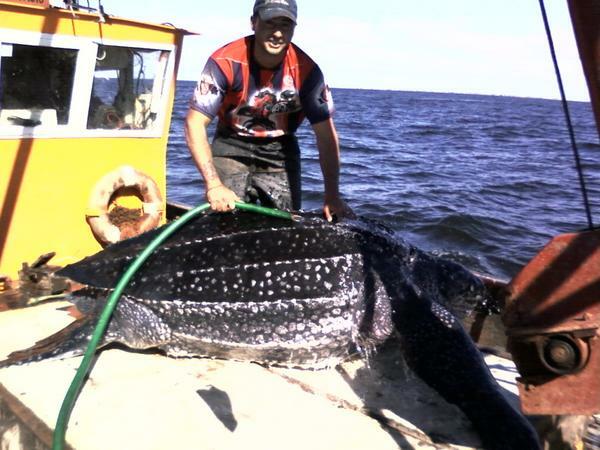 Leatherback caught in shrimp trawling net off Argentina. 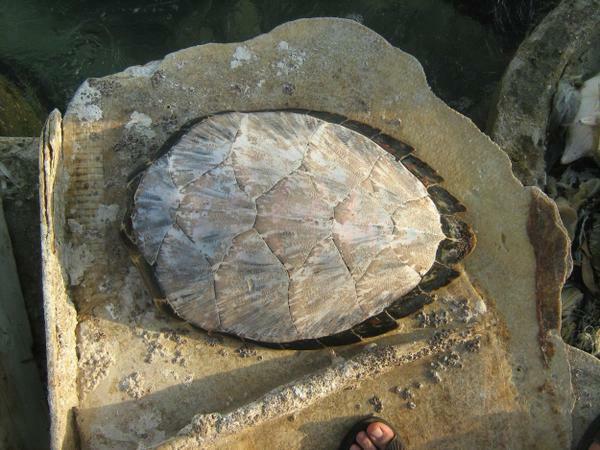 Fisherman attends the turtle until it can be tagged and released. By-Catch: Marine life caught unintentionally in various types of fishing practices: shrimp trawling, long-line (for swordfish, tuna, sharks, and mahi mahi), gill-nets — banned, but used illegally in some areas of the world or by small-time fishermen. 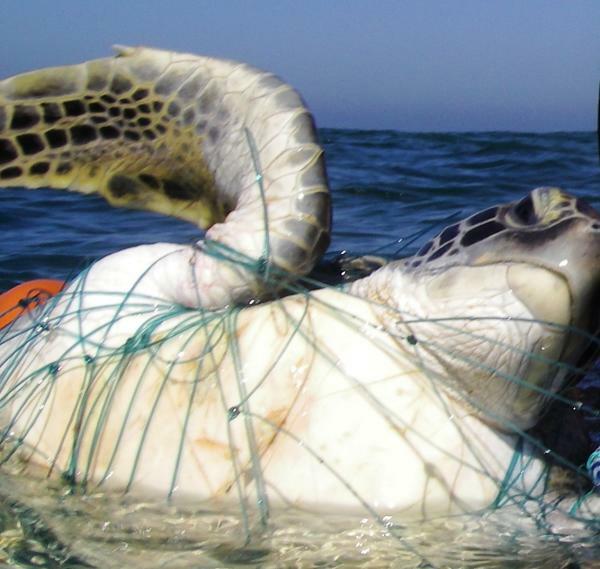 Even sport fishermen can end up hooking turtles. Peer-reviewed compilation of scientific and government studies 1998-2008. 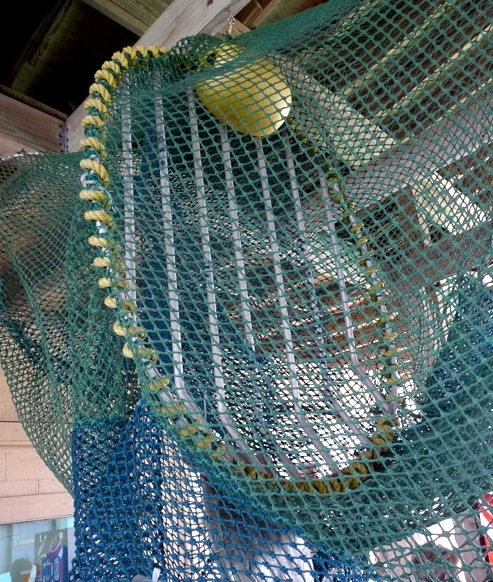 Turtle Excluder Devices (TED) on shrimp trawlers allow turtles to escape. Mandatory in U.S. and many other countries. Must be used, and used correctly, to be effective. They don’t eliminate by-catch issues of many other species. 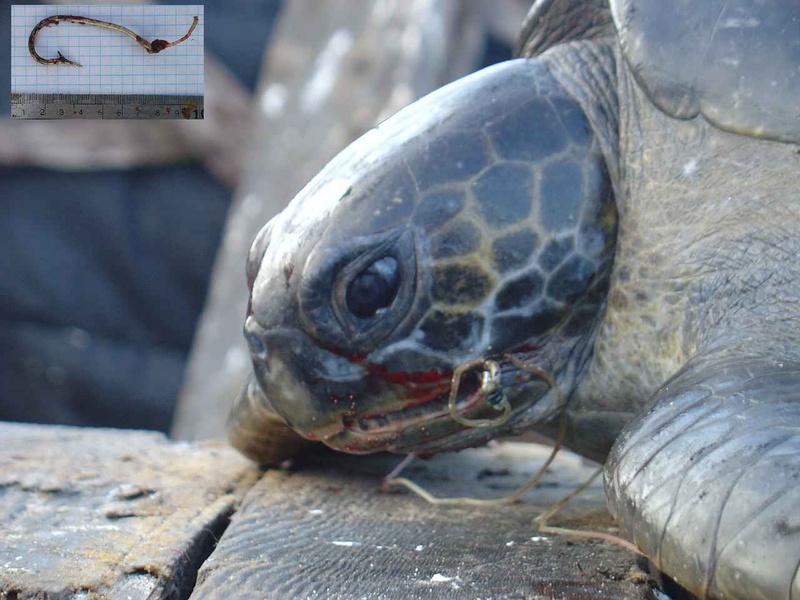 Controlling timing and location where fishing is allowed (during breeding season and in areas where turtles come together to mate, for example) can reduce the numbers of turtles killed. Sport fisherman must know the proper gear to use and methods and regulations on handling an accidentally hooked turtle. 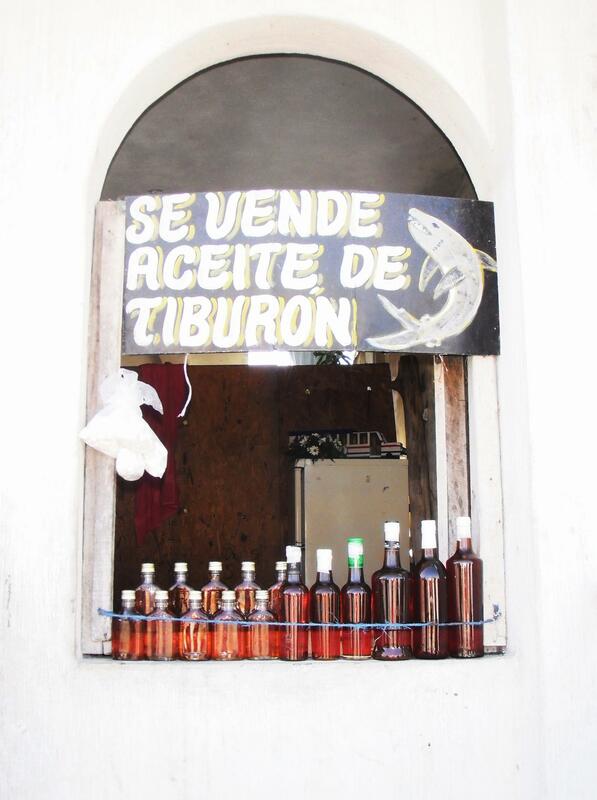 photo: Ignacio Garcia-Godos, Peruvian Centre for Cetacean Research. Never throw gear away in or near any water bodies. Pick up others’ trash fishing line, netting, rope, or anything else that might accidentally snare an animal or bird. Plastics and balloons: Plastics are a huge and growing problem in the ocean as turtles and other marine creatures mistake them for food. 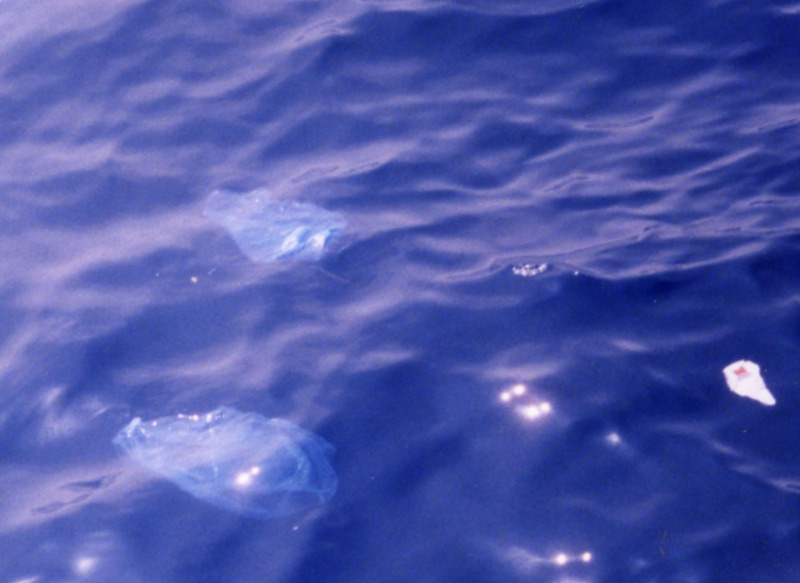 Floating plastic bags look like jellyfish-some turtles’ favorite foods. 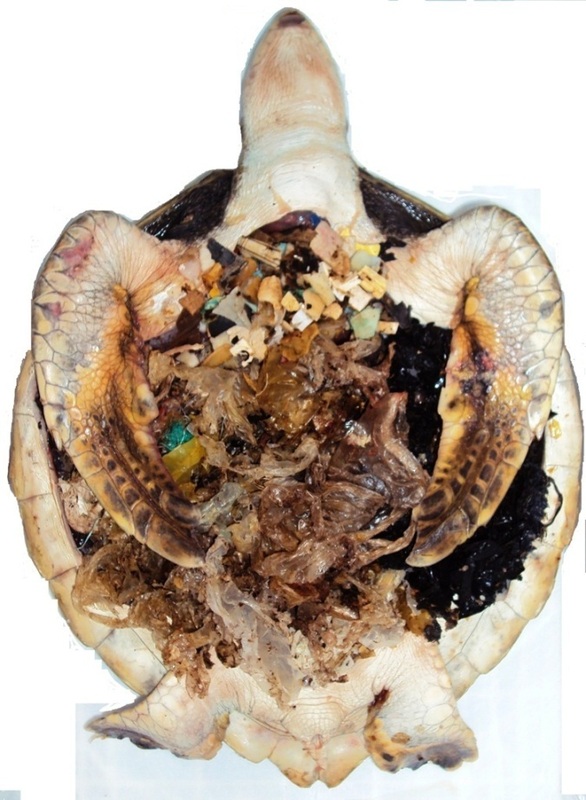 50% turtle 50% plastic The juvenile turtle below died from eating plastic. It’s not an isolated case, by far. These animals, sea birds, too, are not stupid, they can’t tell the difference by sight between our junk and their food. Reduce plastic use as much as you can, recycle, and support local community bans on plastic bags. Bring your own cloth ones. No party for this Kemp’s ridley! 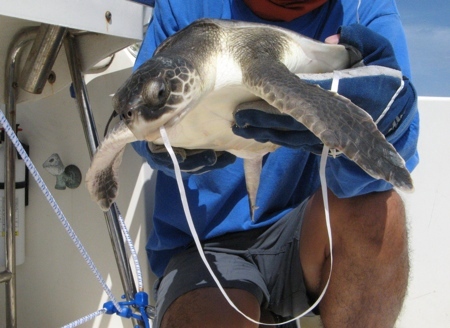 That’s a ribbon still tied to a balloon this little guy swallowed off the Sarasota, FL coast. Never release balloons in the air, even inland. They float farther than you think. Wherever they land, they’re always garbage. Boat strikes: Driving too fast makes it hard to see turtles swimming just below the surface or when they come up to breathe. Jet skis are quick fun but like boats, can be deadly for turtles, dolphins, and manatees. Solution: Slow down and watch. 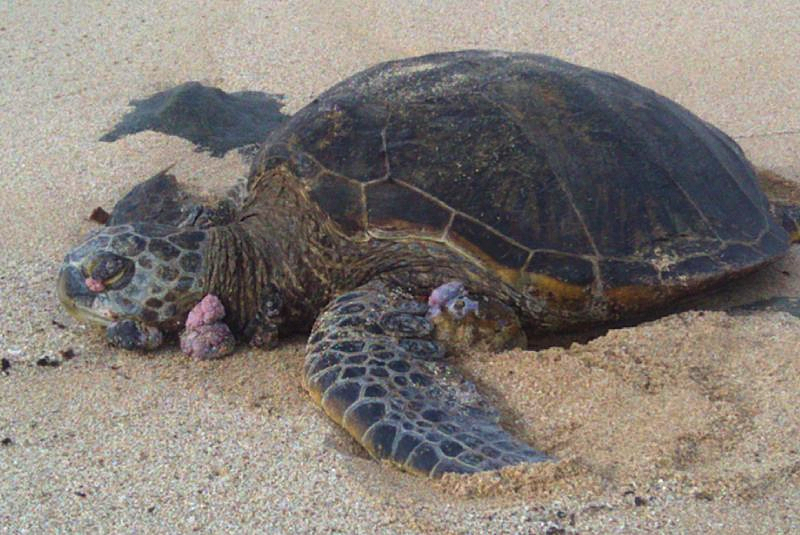 Disease: Fibropapilloma tumors (pinkish blobs on neck, face, and behind front flipper of this turtle) appear on more and more turtles across oceans. 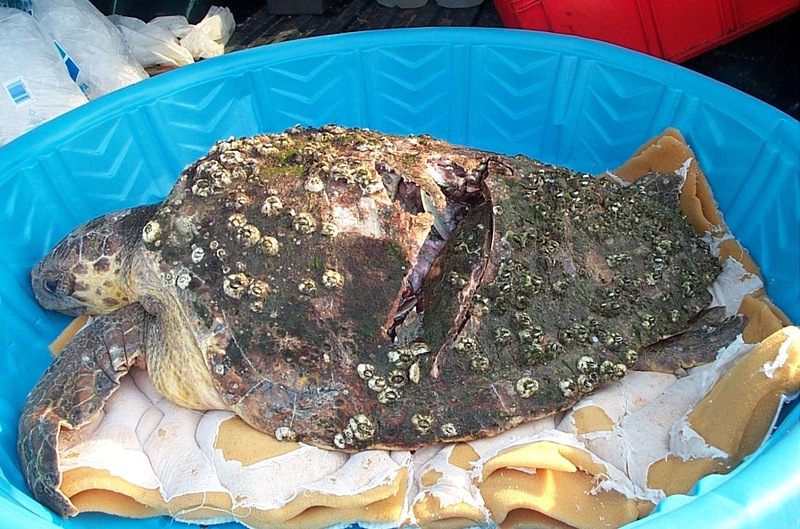 The Green sea turtle (Chelonia mydas) is the most affected, but loggerheads, flatbacks, hawksbill, olive ridleys, and leatherbacks are showing up with the disease, too. Wart-like growths spread mainly on the skin, but can attack internal organs. The cause is a herpes virus, but other links may be pollutants, such as improperly treated sewage released in the ocean water near shore. Not all turtles die from the disease, but there is no cure and research is ongoing. Poaching: Illegal (and some legally sanctioned) taking of endangered animals for food or profit happens on beaches and boats world-wide. Cold-stunning: Turtles who migrate into colder waters, like the Atlantic, to feed sometimes don’t move back south quickly enough to avoid winter. If their body temperature drops too far, they float on the surface, unable to swim. Often they are washed ashore where they can freeze to death. Many areas have volunteers who walk the beaches hoping to rescue them. In Massachusetts the New England Aquarium in Boston and MA Audubon Society have partnered over 20 winters to recover and rehabilitate cold stunned turtles found on the state’s shoreline. 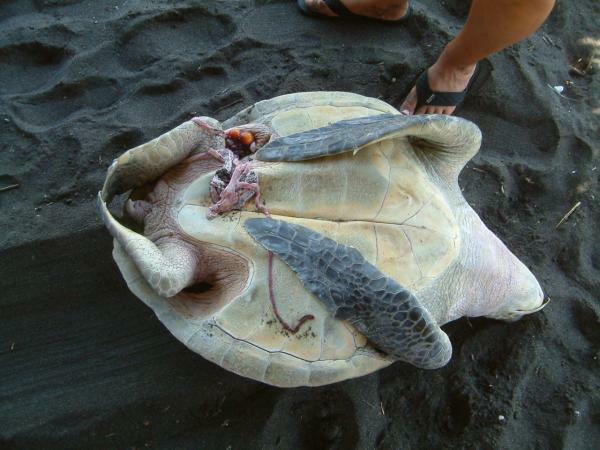 Water pollution: All types of contaminates affect sea turtles and their food supply. These range from sewage discharge, organics from fertilizers, oil and industrial chemicals. Solution: Legislation, such as the Clean Water Act in the United States, is meant to ensure clean source and drinking waters. Oil development in U.S. waters is also regulated, but regulations are not always followed. Enforcement is more limited than the problems and solutions demand. Short-cuts to save industries money often short-cut the environment. People have to remain vigilant, encouraging and promoting politicians, agencies, and industries to do the right and legal thing. Apathy: Cruise the Internet and you’ll find scads of people and organizations involved in sea turtle conservation, world-wide. It’s heart-warming, but it’s not enough. Don’t think someone else has got it all handled. Solutions: Some of the biggest threats to marine life (and ourselves and future generations) are ones we can individually do something about. But for any number of good or bad reasons, we don’t bother. Controlling our use of plastics would be a huge help, next to keeping stuff out of the water supply that shouldn’t be there, e.g. don’t flush toxic stuff or medicines. Everything has to go someplace, but the right place helps all of us.